I do appreciate the work you put out for us to read. Continue the good work. This book has a soul. This book has a lot of character. I enjoyed this very much. The value of this book merely resides on the quality of the essays. Very good collection of Mikee Romero considering how young he is. Congratulations to Artes de las Filipinas. This book is more valuable than the artworks inside. Good compilation of collections and collectors covered. Miss Christiane de la Paz, big congratulations to you and Artes de las Filipinas. We are supporters of your book here in Singapore. You are more than welcome to do Private Collections: Singapore Art Collectors. I have left our contact details in your mailbox. No one works as hard as a young writer does. This book is hard work and dedication. Congratulations for conceptualizing and publishing this book. Inspiring for many readers and start-up collectors. We enjoyed in this book the art collections of Wilmer Hontiveros, Eddide Chua, Manolet Salak, Ester Gabaldon, Mikee and Sheila Romero and Arsenio Tanco. Incredible joy and honor to see that a publication such as this is being made today. More Power! 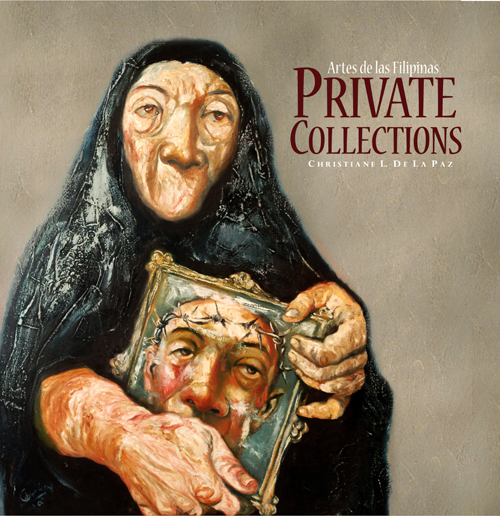 The choice of the themes in paintings of many collectors in this book owes something to their origins but from what I have read none has reflected the prism of his experience in his art collection than Joel Butuyan. The wellspring of his art collection reflects the story that was written about him. Many collectors also left marks: Charlie Cojuangco, Joven Santiago, Washington Sycip, Saul Hofilena, Billy Abueva and Arsenio Tanco. If some biographies in this book have a few shortcomings, it is its uneven treatment of length for the life stories of some collectors while others have been fully explored. It appears that the author has a sensitive understanding of her subject’s contributions which makes the book especially valuable and an important read. She presents the moving portraits of each collector as glowing and meaningful as their art collections. This book is a cultural history as well as a biography of art collectors in the Philippines. It makes for interesting reading. Kudos also to the concept of book covers and layouts. It is hard to overstate my enthusiasm for this book because many of the art collectors in this book are my friends. This book brings together various art collectors in the Philippines, young and old, popular and unpopular, extraordinary and plain (a powerhouse of names): what ties these men and women together is their love of art collecting. Reading their stories, knowing about their personalities and viewing their collections make me so jealous that I am not part of this great book endeavor. I couldn&apos;t imagine any author putting up a cover that has nothing to do with the subject. This is the reason why I like this book vey much. I tried to look at the covers from various perspectives: personal, professional, in comparison to other covers and in view of various trends of art books at the moment. On a personal point, I am impressed by the technical expertise involved in the covers even if some of the images chosen look scary. I love the Pieta cover and its back cover is an extension of its front, only, it was done at a different period by no less than Botong Francisco. On a professional level, hats off to the attention given to the book&apos;s spine; it seems the book was intended to be placed standing and not laid out on a table. It makes it easy for a reader to pick this up because it gives the book&apos;s title, the author&apos;s name and a small image of the book&apos;s front cover. The attention that was even put on how the book is to be stored in a shelf is something that impresses me the most. As compared to other art books, none has been as original in concept such as this but the trend of having a limited edition is really not that original. Needless to say, I can only think that economics has something to do with this but the addition of a CD-ROM makes the book even more interesting and highly coveted.